When she learned her teenage son, Sam, was going to become a father, best-selling author Anne Lamott had mixed feelings. Her spiritual faith and her confidence in her son and his girlfriend, helped Lamott regain her balance by the time baby Jax turned 1 year old. In this personal journal of her grandson’s first year, Lamott shares universal fears and hopes, questions and answers. From the moment Anne Lamott learned she was to become a grandmother, the normal routines of her empty-nest life ended. In their place came worry about how her 19-year-old college-student son, Sam, and his girlfriend, Amy, would handle parenthood, their relationship, school, medical bills, work and their apartment. 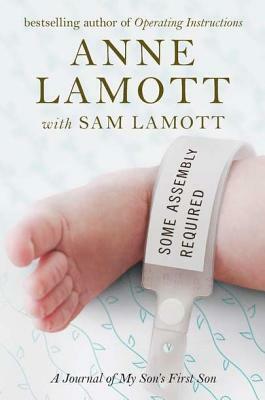 Some Assembly Required is combination of Lamott’s personal journal and interviews with her son that reveal how they were both forever altered when Amy and then Jax came into their lives. This honest and frank examination of Lamott’s concerns, joys, mistakes and triumphs will resonate with readers everywhere. As Lamott writes in a letter to Jax: “No one got the instructions. That is the secret of life. Everyone is flailing around, winging it most of the time… This lack of instruction manual is how most people develop compassion.” And true to these words, the family’s year of adjustment was emotionally and physically draining as Lamott, Sam, and Amy learned their new roles, all the while solidly united in their love for the baby. Some Assembly Required is a reminder that parenthood and grandparenthood are difficult no matter the circumstances and that faith, love and communication help us hold on to the joys and let go of the negatives.